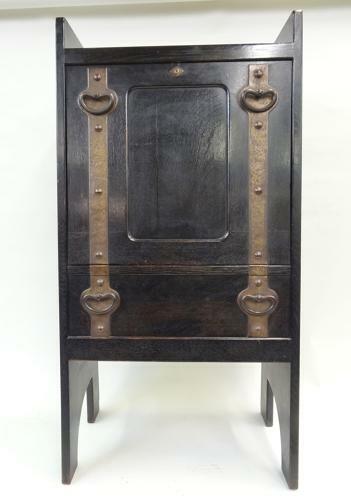 Glasgow Style Arts & Crafts ebonised oak bureau cabinet by Liberty & Co; design attributed to Leonard Wyburd; c1900. Beautiful muscular metalwork strapwork hinges & handles to front. Stylish broad tapering sides; theoverall look very "Mackintoshy"
Bureau/desk top section (with a later removable drinks holder so can be used as a cocktail cabinet!) with semi-opening drawer to base.